Traditional sauna comes from a 2,000-year-old Finnish tradition. Heating temperature is approximately 180 degrees Farenheit, which promotes the cleansing of skin, wellness and relaxation while you are enveloped in warm air. 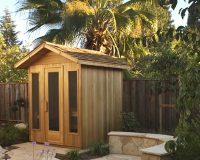 Traditional saunas are available in custom cut or in prefabricated kits. Custom cut saunas are used when building a permanent sauna within an existing or new structure. 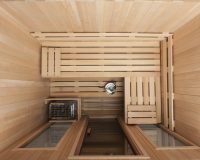 This kind of sauna allows you to optimize the space and reduce cost of construction by using the existing structure’s walls and ceiling. Prefabricated saunas allow for portability if you want the option of moving your sauna down the line. Infrared sauna is known for its low temperature, which ranges from 130F to 150F. Energy-dispersing panels stimulate sweating and provide similar health benefits to traditional sauna. Infrared sends heat directly to your body, rather than heating the entire space. This type of sauna is better for those who can't handle the high heat of traditional sauna. InfraSauna is a combination of traditional and infrared. It is best suited for those who want the versatility of having both styles of sauna for a more customized experience. Any type of traditional sauna can be used with InfraSauna. For the best experience, the traditional sauna is turned on to heat up the sauna, then switched to infrared during use. Which type of sauna is right for you?